We headed to a spot that had open water, but lots of ice covering the access. After an hour plus of chopping a path the width of our trailers, we were able to get the boats launched. 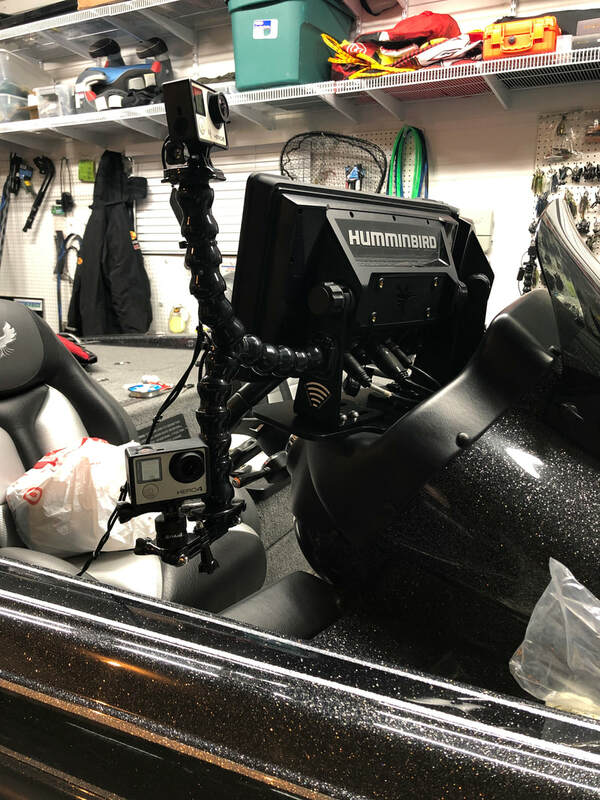 This wasn't a fishing mission, rather a trip to get everything dialed in and make sure both boats were working properly for the upcoming season. The mega plus is incredible and really gave us a glimpse of what to look forward to this season. New video featuring green and brown fish! Sometimes I wonder how much these bass cost a guy over a lifetime. I know they have me addicted and doing whatever it takes to stay after them. Capturing footage and watching these fish is almost as rewarding as the catch itself. Nothing beats a smallmouth with banged up lips from crushing and punishing the crawfish population! On Feb 14th I headed to the airport in Fargo, ND. The temp was -5 with wind chills approaching -45. Knowing I was heading to Long Beach and hanging out with Oliver Ngy for 4 days was an awesome feeling. Flying into LAX and seeing the Los Angeles lights was amazing. We spent 2 days working on the Dream Machine 1.0 doing wiring and other tasks. Then we threw big swimbaits for 2 full days looking for that one big bite. It was a great 4 days and already looking forward to the next trip out there at some point. These dual mount arms make it super easy to get different views from one location. I usually angle the top one towards the center of the bow and the bottom one over the top cap to record the fish jumping and fighting it's way over the boat. I run power to each gopro to keep it running all day. Over the years I've changed from recording the entire day, to just using 5 minute looping now so after each fish catch or important event it saves the last 5 minutes. With high quality footage, this allows you to fit most of your key events on one sd micro card. During the hot months, I'll record in a lower resolution and frame rate to keep the cameras from over heating. If you are trying to record 4k in 60fps, that definitely heats up the camera. Throw in some 90 degree sun shining down and you will have issues. With the next 7 days showing highs in the mid 20's to low 30's, and lows showing from low teens to low 20's, this might have been our last chance to go chase some monster smallmouth. The water was 42-43 degrees and the fish we found were curious if you triggered them, but for the most part they wouldn't give you the time of day. We spent all morning trying to figure out what to do to get the fish were were seeing on the sonar to bite. Looking back we found 3 different baits, each one working in a different type of bottom content. 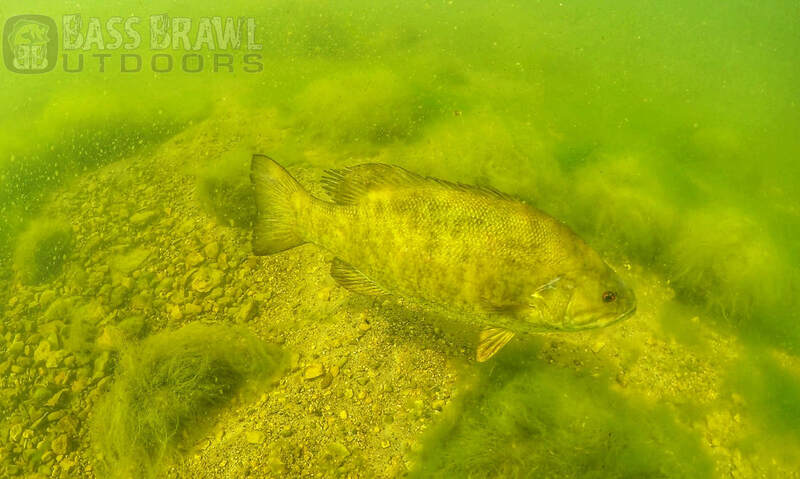 One thing we are learning is that when a smallmouth doesn't want to eat, there is very little to get them to change their mind. 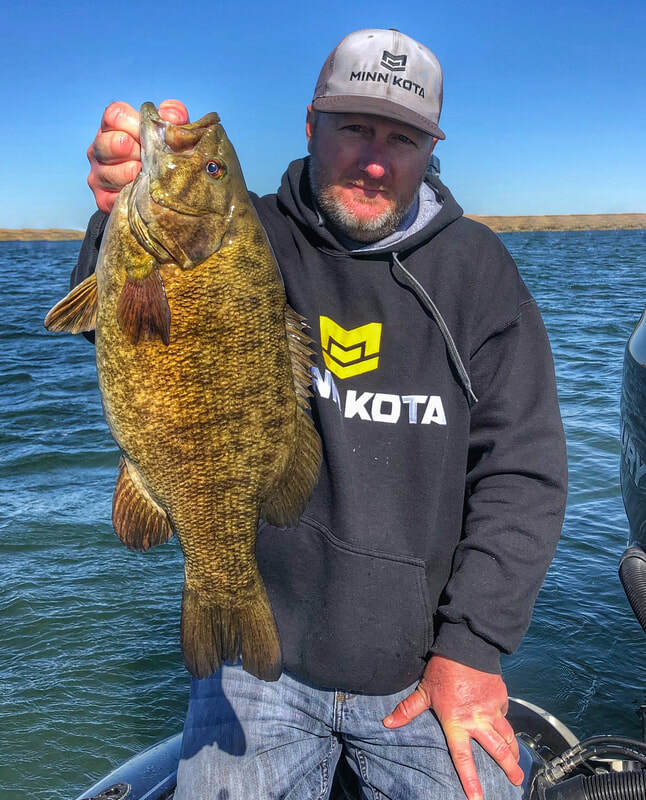 What we learned yesterday on getting those negative mood fish to bite, is going to pay huge dividends next season when we face the same conditions. If you're going to put the boat away until Spring, it's a little easier going out by putting your best 8 bass in the boat for 43+ pounds. Only fish over 5lbs get to pose for the camera. If you are a 4.99 you don't make the team! 98% of our chase revolves around the bass, but I love it when we find large pods of big crappies or bluegills. Using our electronics we find these offshore pods and chase, cast, catch and release. The fish are often traveling very fast. If you don't have good electronics there is no way to stay next to them. The biggest key is to be able to see them out in front of you so you can cast too them before the boat scares them. Please keep the smaller fish for the frying pan and let the big ones go to keep the lake healthy. Back to the Largemouth Beatdowns! I took one of my high school team anglers with on this short trip. He had 4 hours to fish before we had to be back. The bite started slow and by the end we were doubling up and making that clicker spin! 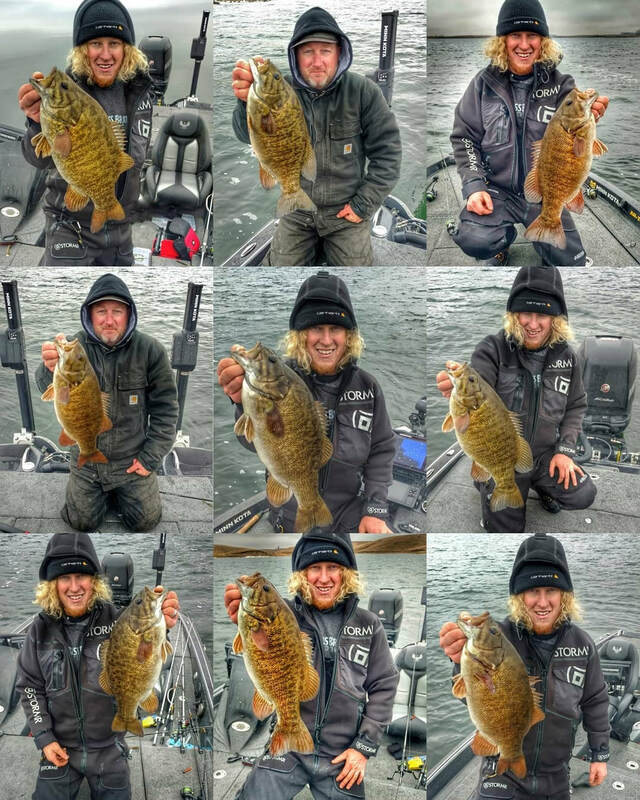 Absolute crazy pattern we are on that is destroying lots of big fish. 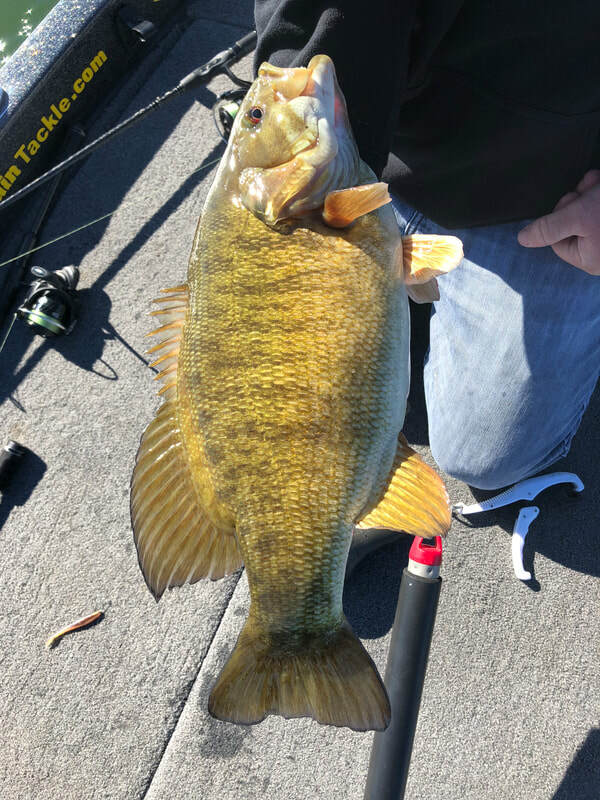 The jig bite is putting 1-2 fish in the boat a day for lots of guys and this pattern is doing that on the first two casts of the day! Water still in that 41-42 range and air temps are really cold in the morning. We had a one hour bite window before the wind changed and tried to make the most of it. Some quality fish. were caught but we had to grind for the bites!